Here are some more recipes top help you design a World Vegetarian Day menu for October 1st. 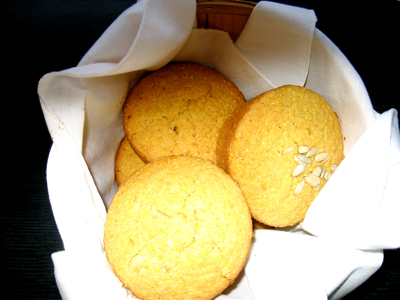 Again, these are from the archived recipes that I have been posting since 2006. Part 2 includes soups, entrees, and side dishes. I also tagged on a couple of miscellaneous recipes. Happy World Vegetarian Day! 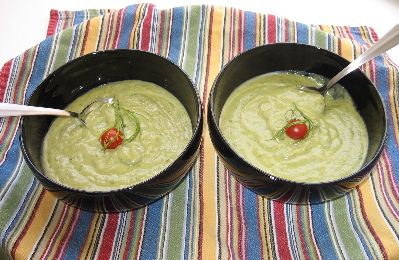 This ABCD soup made from avocados, basil leaves, cucumbers, and dill leaves. Good choice if Oct. 1st is a hot day! 2. Take peeled (and seeded) cucumber and cut into chunks and add to avocado. 4. Add fresh herbs and puree again, until soup is smooth. Serve chilled, garnished with a small tomato and some extra dill leaves. 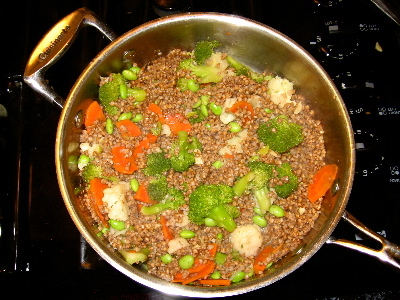 one cup barley, rice, quinoa, kasha, etc. 1. Cook barley or other grain according to package directions. It expands a lot, so for every 4 cups of water, you can use 1/2-3/4 cup barley. 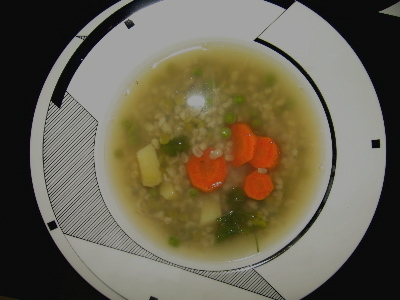 For a really thick stew-like soup, use up to one cup of barley. 1. Put peas in water and bring to a boil. 2. Turn down the heat and add the other ingredients. 3. Cook about 1/2- 3/4 hour, until veggies are tender. 4. Allow to cool slightly. Set aside bay leaves and a few slices of carrots. 6. Replace bay leaves and sliced carrots. Warm the soup and serve. 1. Bring 2 cups of water or soup stock to a boil. 2. While waiting for the water to boil, place one cup rinsed kasha in a large fry pan. Dry roast the grains until they are lightly browned, stirring often so they donâ€™t burn. 3. Add boiling water carefully to roasted grains, along with garlic and scallions, as well as the other veggies. Place on simmer and cook until all water is absorbed, adding salt & pepper(or soy sauce) to taste. Important Note: Depending on the size of your pan and how high simmer is on your stove, you may have to add extra water or broth to keep the grains from sticking. A true pilaf is made by roasting the grains in oil, which I no longer do, as explained above. 5. Stir in 2-3 T. olive oil right before serving, after the dish has been cooked. * A note about vegetables: I made the soup, soup stock, and veggie stew all within a few days of one another, so the broccoli was divided with the tops going in the stew or pilaf and the bottoms going in the soup stock. Feel free to use other vegetables that you like. Be creative and choose what you enjoy and what is seasonally available, such as cabbage or turnips. Short Cut Hint: Imagine Foods has created soup stocks, both meat and meatless, available in health food stores and supermarkets. These stocks are handy when you donâ€™t have time to make a stock or want more flavor for all of your dishes. 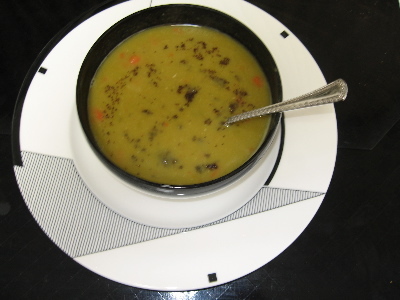 There is a variety of stocks, from chicken and beef to mushroom and just plain Vegetable Broth. Note: This was from one summer that I grew purple basil and regular basil on my patio. Either will do in this recipe. 2. While pasta is cooking, place olive oil in the base of the blender or food processor. Add garlic, basil leaves and sea salt to the blender and puree until smooth. 3. Add smashed pine nuts. (If your food processor has strong action, this may not be necessary.) Pulse for a few seconds so pine nuts will blend into the rest of the ingredients. 4. Drain pasta, rinse with cool water. Then toss with pesto. Add olives and/or tomatoes as a garnish and serve. Can also be serve chilled. Roasted vegetables are everywhere. I recently went to an Italian restaurant that served roasted veggies over shells. 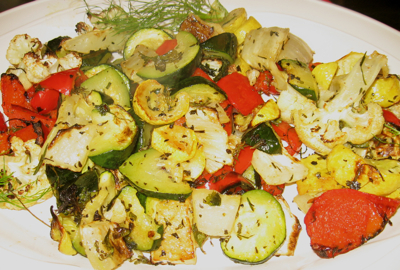 This roasted veggie dish emphasizes the red, green, and white of the holidays, with yellow for the color of the late fall leaves. One of my college classmates sent me her favorite roasted veggie dish, which prompted this recipe with my choice of veggies. 1. Cut all the veggies as described. Place in a large bowl and toss with 2-3 tablespoons olive oil and herbs. 2. Place veggies on a baking sheet and bake in preheated oven for about 15 minutes, tossing once; then switch to broil for 3 or 4 minutes until desired crispness, tossing once. Sprinkle on a little more olive oil or fennel dressing right before serving. 3. Serve over rice or pasta or just as they areâ€”colorful and crisp! Note: If you want to use new potatoes or fingerlings, precook for 5 minutes while cutting up other veggies. If you want to use asparagus, trim and cut into thirds, adding after veggies have baked 5-7 minutes. 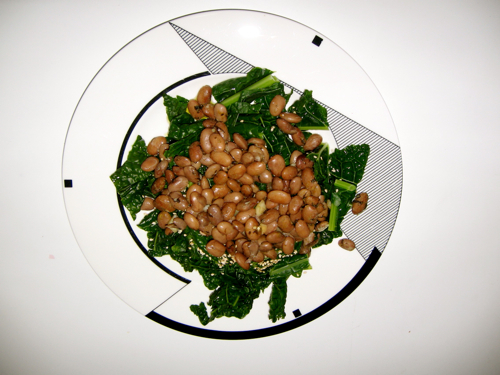 Note: This photo is one featuring pinto beans and kale. However, you can use any bean of your liking and any green of your choice. Prep. Time: About 10 minutes if beans are pre-cooked. Cooking Time: About 10 minutes if beans are pre-cooked. 1. Wash and cut greens into bite-sized pieces. Place in enough water to cover and cook until wilted. (Kale may take longer than either chard or mustard greens. Check for desired doneness.) Drain, reserve the water for plants when the cooking water has cooled. 2. While the greens are cooking, warm the beans. (If using canned, warm in the liquid, then drain liquid.) If using ones that you soaked and cooked yourself, you can warm them in a small pot with a little added water. Add the spices to taste. 3. Place drained greens on a serving plate. Scoop flavored beans onto greens and serve immediately. Note: This is an inexpensive, nutritious side dish that can be used as a main dish when chicken, fish, tofu, or tempeh, etc. is added. If beans are not pre-cooked, add 1/2 hour-one hour of cooking time, depending on whether or not they have been soaked, sprouted, or frozen. 3. Spread with tahini, mayo, or mustard. 4. 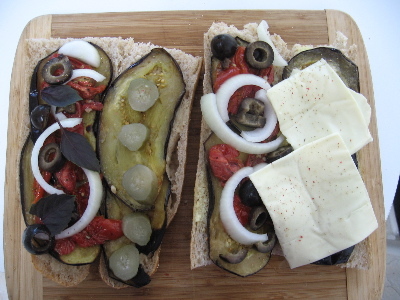 Layer on the roasted peppers or tomatoes, olives, pickles, and cheese slices, if using. Other Sandwich Ideas, mostly from my book The Whole Foods Experience. Remember, these can be made on any bread you like, and if you are allergic to wheat or on a totally gluten-free diet, check out the gluten-free flax bread at Whole Foods. The rice breads crumble and some of the others are also not great for slicing. More information will be coming when I do a gluten-free posting. 1. Natural nut butter (peanut, almond, cashew, pistachio, soy, etc.) without sugar, hydrogenated oils, or preservatives) with grated carrots on whole grain bread. 2. Egg salad or tuna salad or tofuna salad (See Salads in Kitchen Nutritrion Index) stuffed into a lettuce-lined pita pocket bread. 3. Apple butter (no added sugar), sliced ripe banana on cracked whole wheat. 4. Cream cheese or Yogurt cheese (See Kitchen Nutrition Index) and honey on date nut bread or a pumpernickel bagel. 5. Natural cheese (dairy or non-dairy), sliced tomatoes, mustard, and sprouts on rye bread. 6. Hoomus (chick pea spread), cucumber, and grated carrots on a whole wheat bun or stuffed into pita pocket bread. 7. Banana slices, nut butter, and fruit-sweetened jam on oatmeal bread or flaxseed bread. 10. Black bean dip (in salsa section), onion, sliced tomato on corn bread. 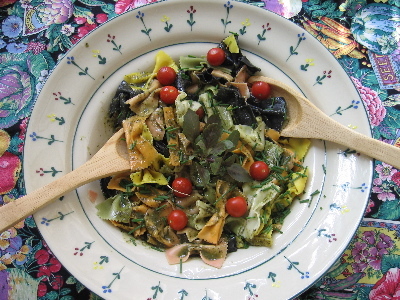 This is a vegan variation of a recipe from Nikki & David Goldbeckâ€™s American Wholefoods Cuisine, Ceres Press. It is my favorite cookbook for basic recipes, like a natural Joy of Cooking. Thanks to the Goldbecks for permission to use their recipe. It is also gluten and dairy free. I substituted almond milk for milk and maple syrup for honey. Vegans do not use honey, because it is food taken from the bees. The book describes this muffin as sweet with a cakelike crumb, but I believe it is more of a breakfast muffin, not a dessert muffin. 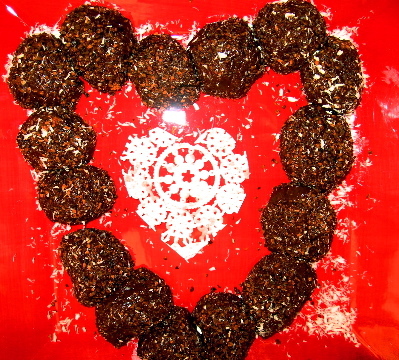 Note: While I originally posted this for one Valentine’s Day, this snack/dessert is good all year round. Cooking Time None, although I freeze the kisses until they are firm. 3. Place unsweetened, dried coconut into a very small bowl. Wet you hands and take a ping-pong sized amount of the mixture in your hands and roll into a ball. Then place the ball in the coconut and roll it around to coat the ball. 4. Put the â€œkissesâ€ on a cooking pan in the freezer and freeze until firm. Remove them a few minutes before serving to allow them to thaw slightly. They can stay in the freezer almost indefinitely (but not in my house!). Thaw-out time may just take longer. Variation: For a more nutritious kiss, you can substitute some of the chocolate powder with a high protein powder. Also, if you dislike coconut, you can use ground up granola, sesame seeds, or any other coating of your choice. *Note: Depending on the type of nut butter you use (some are more oily than others) and how much sweetener you use, the amount of cocoa powder will vary. Just add enough to keep the mixture togetherâ€” too wet, you wonâ€™t be able to form balls; they will be flat; too dry, the coconut wonâ€™t stick. Youâ€™re looking for a slightly moist play dough consistencies. This entry was posted on Monday, September 28th, 2009 at 7:29 pm	and is filed under Kitchen Nutrition. You can follow any responses to this entry through the RSS 2.0 feed. You can skip to the end and leave a response. Pinging is currently not allowed.